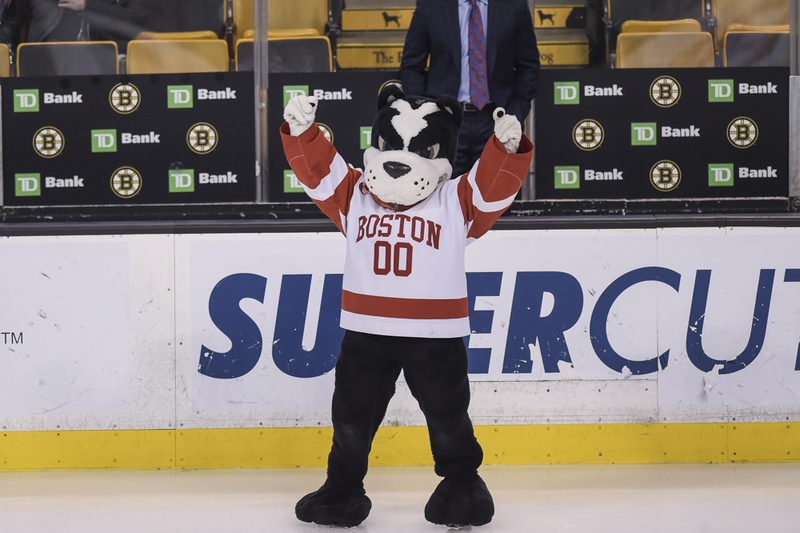 Whether he is climbing into the stands at a Boston University hockey game or parading around the George Sherman Union, Rhett the Terrier is an unmistakable figure on Commonwealth Avenue. Chances are, you have exchanged a hug or a high-five with him at some point. But have you ever thought of the person inside of the suit? There are four to eight different BU students who share the Rhett duties, according to Connolly. Some of these students are solely responsible for handling Rhett and guiding him around when he is due for an appearance, while others are dedicated exclusively to wearing the costume and playing the role of Rhett. For those who play Rhett, putting on the suit is a rewarding experience. Students in the suit often learn to embody the persona that Rhett brings to the table. The position is paid, according to Connolly, with mascots making $12.25 per hour and handlers $11 per hour, and for good reason — being Rhett is a considerable time commitment. Rhett is a wanted commodity at many BU sporting events and community outreach programs. Rhett also fulfills external requests outside of athletics, picking up cameos at cultural events on campus in addition to bar mitzvahs and birthday parties around the Boston area. On BU’s annual Giving Day, Rhett was parading around campus to promote those involved with BU to donate to the university. Last year, Rhett even appeared at an engagement announcement, a showing which generated local media attention. Connolly said BU Athletics only had one student employed as Rhett last year, which was an obstacle at times due to the vast array of inquiries for the mascot to appear at events. When this student, who graduated last spring, had class or a job interview to attend, Rhett was subsequently absent from anything that was occurring at the same time. The mascot was often only visible at hockey or basketball games. This led to BU Athletics putting an emphasis on broadening the Rhett program heading into the 2017-18 academic year. With Rhett being a fixture at hockey games, having multiple students that can skate is a necessity. Currently, two students who work as Rhett are experienced skaters, while others are in training for gliding around the ice at Agganis Arena or Walter Brown Arena. Each mascot goes through an initial tryout to simulate what an actual game night is like. For those who can skate, Connolly said she has them pretend to skate out onto the ice with the team and bang on the glass pretending as though fans are in the arena. Once a student masters skating, he or she can work on learning a whole array of tricks for entertaining fans while rocking the suit. “Besides being in the center of the arena, skating on the ice also gives Rhett the opportunity to pull crazy, fun stunts like diving across the ice, doing a shootout and even having a dance-off on center ice,” a student who plays Rhett said. Being Rhett has its perks, with appearances at TD Garden for the annual Beanpot tournament, Madison Square Garden for the biennial Red Hot Hockey tilt, and potentially Belfast, Ireland for the Friendship Four next season as part of the men’s hockey schedule. For many students, however, getting the chance to throw the costume on and cheer up children in the community is the most rewarding experience. In December, Rhett went along with BU student-athletes to a local elementary school as part of the annual Holiday Reading Program, with the mascot spending time with kids from each classroom in the school. The effect of Rhett on the kids made putting on the costume well worth it for the student on duty.